"Though smaller and friendlier than most Floran, looks are deceptive, and Nuru is a lethal warrior, capable to taking down far larger opponents." Least Favorite Thing: Kidney beans. They sound like meat, but they're NOT MEAT. Nuru is a commander in the Floran Tribe. Although loyal to her tribe, she is strangely reticent about her origins. A young Floran, and a talented hunter and fighter. Nuru is a lively, intelligent and courageous commander whose skills are out of this world. If there's something in between a Greenfinger and a normal Floran, it's Nuru. A highly skilled and enthusiastic hunter, this feisty teenager is nonetheless significantly less destructive than your average Floran. Clever and quick-witted, Nuru excels as a commander, and is highly valued by Greenfinger Zawan. However, when they first met, Nuru let Zawan know that this wouldn't be a long visit. Greenfinger is still not exactly sure where the youngster travelled to Aurania from, only that it was on a ship that had, to quote, 'travelled a massively, ridiculously long way'. Wherever home is, the Floran leader will be sad to see Nuru go when the time comes. Nuru's Groove is Teleport Beam, which allows her to immediately beam down any unit next to her. The purchase window appears and the player selects which unit to purchase. Only units that you can afford are shown. The unit activates immediately. You need to control at least one of the building that you would normally create the unit from in order for it to be available. Swordsmen, Pikemen, and Dogs can be summoned even if you don't control any Barracks. Nuru's Teleport Beam allows an extra unit to be quickly called up when a map is short on recruitment structures, allowing enemies that might otherwise cause trouble to be swiftly countered. Nuru is voiced by Elsie Lovelock. 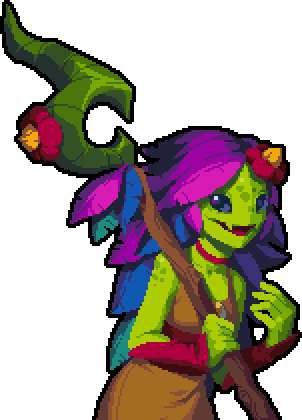 Nuru first appeared in Starbound, another game developed by Chucklefish, and was first revealed as a commander in Wargroove in the game's announcement trailer. According to Chucklefish's official tweet, Starbound and Wargroove share the same universe, with Wargroove set after the events of Starbound. Except for Nuru, nobody else has any knowledge of the events of Starbound. This explains her vague reference to her ship that traveled long ways, which most likely is her spaceship in Starbound. Another nod to her being from "Starbound" universe is her groove ability, which looks like she is "beaming" a unit from her ship, identically how you would beam yourself to a planets surface in "Starbound".